Hot drinks have had their moments in the spotlight on this blog, but they tend to be on the peripheral of reviews, mentioned in addition to the food on offer as an extra indication of a venue's style and worth. On this occasion, however, there's no food stealing the limelight, in part because this particular venue doesn't really serve food (with the exception of the odd pastry): at BBB, it's all about the coffee. Run by the same bloke who looked after St Ali in South Melbourne, this is a cafe devoted to the service of the best coffee possible. There's not a lot to recommend the place from the outside - an intriguing shingle would probably indicate a boutique rather than a cafe to the uninitiated - yet within that subtley is an immediate allure, and that's before you notice the flock of chairs stuck to the ceiling. Coffee franchises often note their 'blend of the day', which indicates which packet they opened under orders from Head Office that morning. At BBB that blend will be something developed and roasted by the guys making the coffee. It's not a place to stop into for a quick takeaway, either: they take the necessary care with each cup. So, what was it about my takeaway cup of caffeine that so tickled the tastebuds? Sipped without sugar, the coffee was extremely bitter, but not in an aggravating way. There was no puckering: alongside the bitter taste was an astonishingly smooth mouthfeel. It actually made me think of a whiskey, in the way tart taste and smooth texture combined. By the time I added sugar it became an extraordinary and, given the lateness of the previous evening, life-giving drink. Update (July 2013): Just imagine it, a venue in Melbourne dedicated to coffee! I had to chuckle, reading this post almost five years after it was originally published. How the industry has progressed in that time. Coffee temples are the business du jour, and to list places in the CBD and inner-north and east suburbs venerating the bean would be no quick task. I love this post! Good old life giving coffee. Thanks! It's a special thing, that coffee. You missing what Wellington had to offer? No way man. Wellington might pride itself on good coffee, but it was normally so strong that they'd drown it in milk. A caffe latte in NZ is more expensive than a cappuccino because it's milk soup with a dash of coffee. I much prefer Sydney coffee - maybe cos that's what I 'grew up' with. It's more subtle, and a latte is respectably served in a tumbler with a napkin tied around it, not this nonsense of a sundae glass. What New Zealand has is a good range of brands, such as Cafe L'Affare, and Screaming Turtle. I've yet to find the equivalents here in Oz - can you recommend a good non-major-brand coffee bean? I struggled with coffee in NZ - I mostly enjoyed the taste, but after one in Blenheim I had pass on driving the car cos I was tripping on caffeine! Genovese is a fairly big brand, and there are those who won't stock it since it sold to Coca-Cola Amatil, but it is a Melbourne brand. 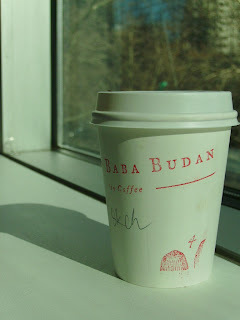 Jasper is good; Ethiopia Gold is a good import; Illy is Italian but some of my fave cafes serve it. I'm sure there are others - anyone else got suggestions? Others that have occurred to me are Eureka - they're quite local to here so I'm not sure if they sell interstate; and Map. Probably a bit late, but I think Grinders is the one that got sold to Coca-Cola Amatil, not Genovese! I still see the old folks at Genovese all the time, they don't care about supporting you with free machines or things to push your coffee sales - they're a relaxed bunch of people who leave work by 3:30pm. lol. 'The Age' ran an article a while back about Italian coffee brands in Melbourne - also helpful for more info on brews to look out for.